Eid is the most special and respectable event for the Muslims. People celebrate this day of happiness with warmness and wear new clothes. To make this event more special, all the major brands introduces special Eid sale 2018 on varied dresses categories. You can grab your favorite designer Eid dress now with reasonable 30-70% discount. 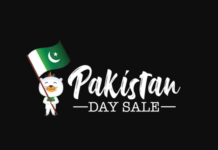 The special Eid sale 2018, you can get ready to wear, unstitched and Pret at reasonable discounts. The sale is offered at different major brands such as Gul Ahmed, Warda, Diners and Cheone. Embroidered lawn shirt (1 pc). Printed lawn shirt with chiffon dupatta. 2-Pc lawn dress for teen girls. 2-Pc net suite for teen girls. Another major clothing brand in Pakistan is Warda. They are offering up to 40% off on different varieties for women. Moreover, you can buy the Eid collection through online or by their stores. So, make this Eid even more special and memorable by buying the latest fashioned collection of Warda. Hurry up, the offer is valid till Chand Raat. 3-Pc lawn printed suite with chiffon dupatta -> 20 to 30% Off. 3-Pc lawn printed suite -> 20 Off. Chiffon lawn printed 3-Pc Suite -> 30% off. Single lawn printed shirt -> Rs 626 only. Lawn single embroidered shirt ->30% off. Digital printed causal shirt for ladies. Another renowned brand named dinner also offer flat 25% off on the variety for men, women, and kids. So, grab your favorite dress now with remarkably discounted prices. Hurry up as it is a limited time offer. Digital Print stitched Kurti for ladies.